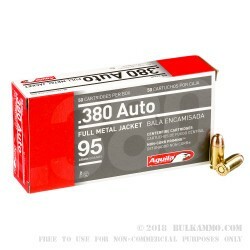 50 rounds of excellent quality .380 Auto from Aguila, a Mexico based munitions manufacturer with ties to Remington. The factory has been producing high quality ammunition since 1961 and is a leading provider of shooting staples, like rimfire ammunition. 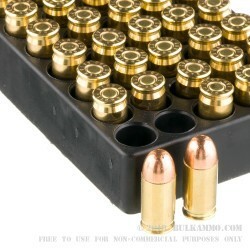 This round is their FMJ 95 grain offering for the .380 which is made for use in all .380 Autos. 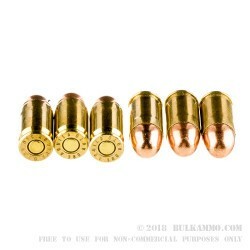 The surprisingly high-performance round works in most mainstream .380’s which are very difficult out of the factory to get working smoothly sometimes. This ammunition is in a sweet spot that even most of the small framed autos that are being produced for the concealed carry market are able to function well with it. This is a suitable round in all .380’s under whatever trade name they carry. .380 can be called 9mm Corto/Short/Kurz and 9x17mm. This can be used in modern firearms capable of firing these rounds. The velocity is 945 feet per second at the muzzle and the energy is 188 ft. lbs. The quality of manufacture is high for the price, and the Aguila name has enjoyed a solid reputation since the company’s inception. 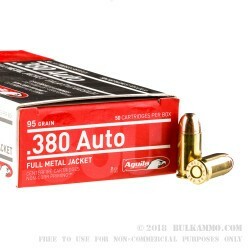 This little .380 ACP is no exception and the shooting experience is very enjoyable with a majority of the firearms in the .380 range.